Last week, the Bureau of Reclamation began delivering water from Millerton Lake to the San Joaquin Exchange Contractors for the first time in history. The Friant Water Authority, which represents 21 water agencies on the east side of the Central Valley, is now suing the Bureau of Reclamation for not providing water to the Exchange Contractors from alternative supplies, as it had done in the past. The Bureau maintains that these supplies are not available and that the water from Millerton Lake is necessary to meet the Exchange Contractors pre-1914 water rights. 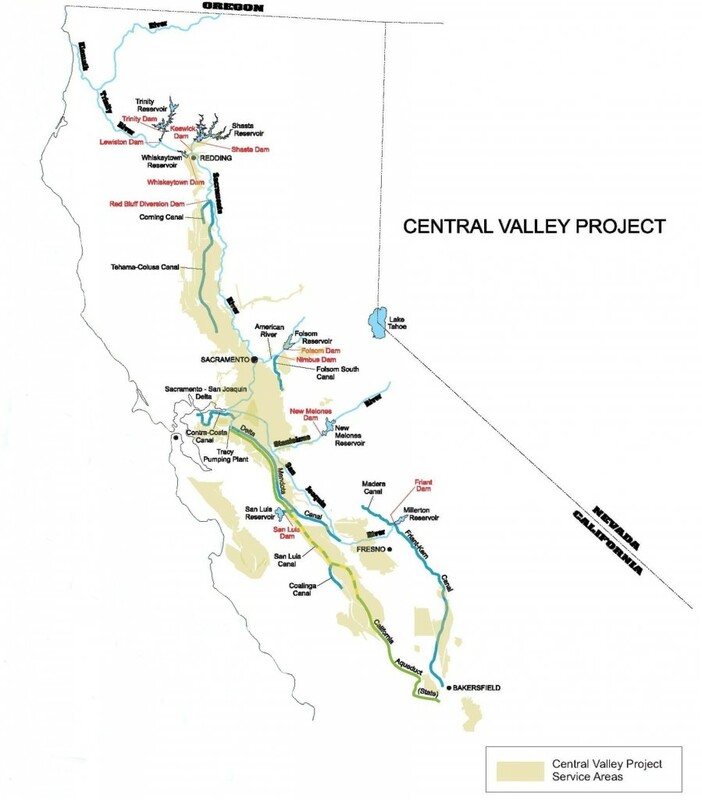 Map of the southern Central Valley Project. Note that the Friant Water Authority typically delivers water to agencies on the east side of the valley through the Friant-Kern Canal. The Fresno Bee reports that the US Bureau of Reclamation estimates 15-40% losses from evaporation and percolation in delivering Millerton Lake water through the San Joaquin River. 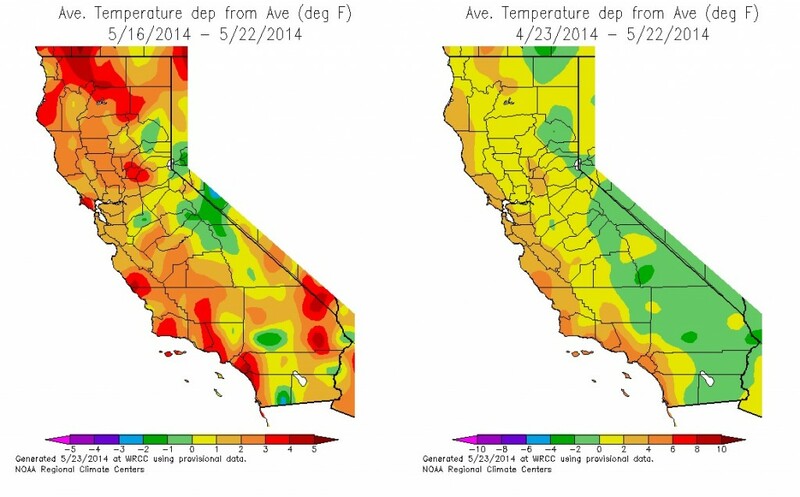 New research shows a 46% reduction in winter fog over the past three decades in the Central Valley. Tule fog is essential for crops such as almonds, pistachios, cherries, apricots, and peaches. Circle of Blue has produced some cool infographics about the drought: one depicts a graph of historical drought trends, another maps California’s canal system, this one is an interactive dashboard showing current conditions and historical trends for major reservoirs, and this interactive map shows water use by county. Drought conditions haven’t changed since last week, so let’s take this opportunity to look more closely at how recent temperatures and precipitation compare to the historical average. Across the board, temperatures in the state have been higher than average this past week (particularly in coastal southern California), while temperatures this month have been higher than average on the coast, but cooler than average further inland. 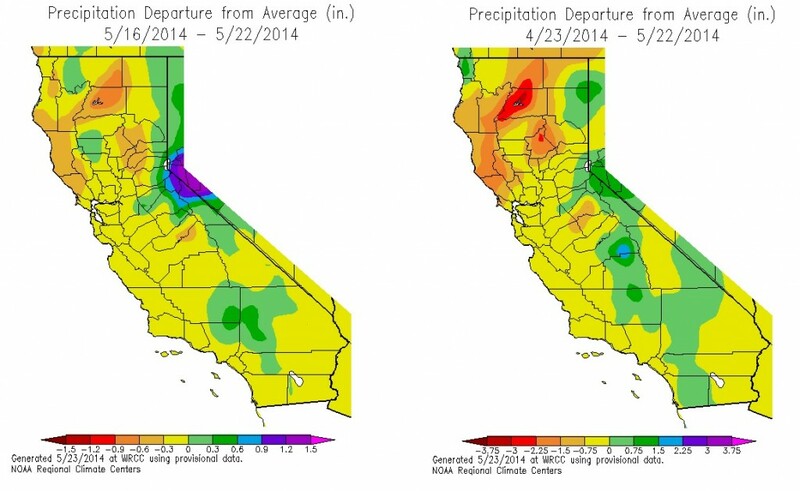 Precipitation this past week and month has been lower than the historical average for most of the state, with particularly dry areas in the north and unseasonably wet areas in the Tulare Lake basin. 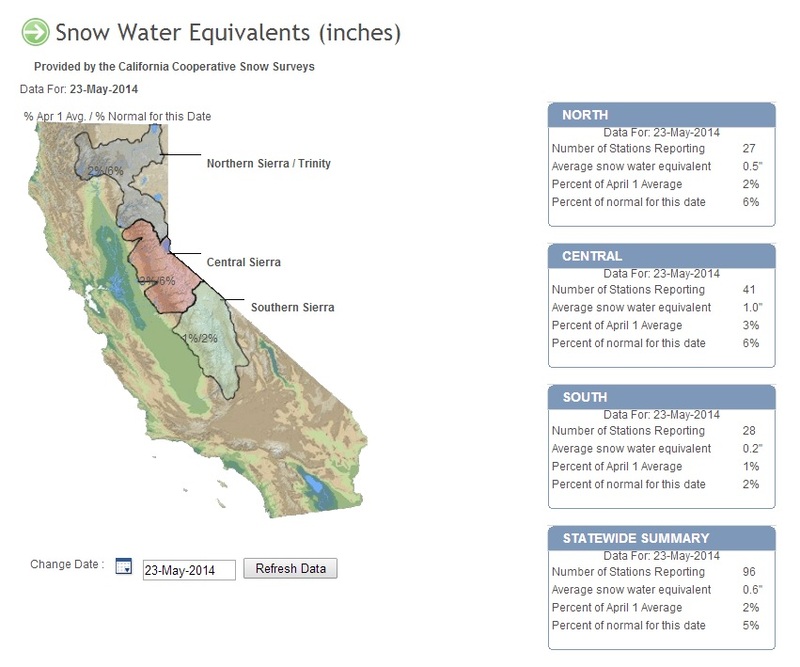 California snowpack is currently 5% of what’s normal for May 23rd and 2% of the April 1st average. Reservoir conditions haven’t changed much since last week. 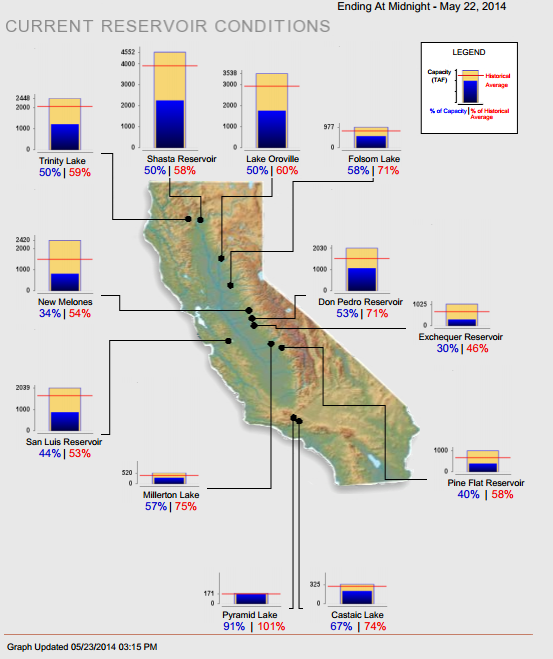 Statewide, California’s major reservoirs are at about 48% of total capacity and about 64% of historical average. 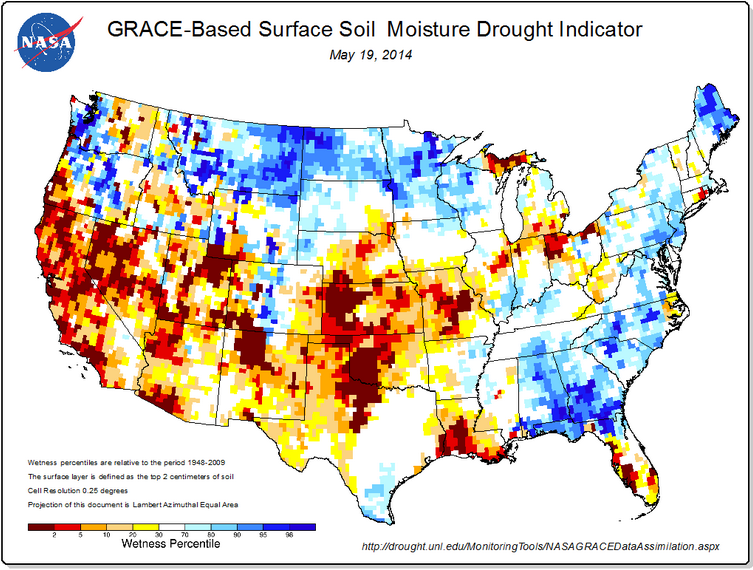 Here’s an update on soil moisture conditions in the state. To see how things have changed, have a look back at last month’s update.